Cultures around the world have been creating images in caves and other rock surfaces for at least 34,000 years. Whether their purpose was aesthetic or functional, these images represent some of the earliest known, and in some cases the best preserved, artistic expressions of prehistoric people. Many indigenous cultures have rich traditions of creating rock images, especially in California. To contemporary indigenous people, the sites that feature these images continue to be regarded as sacred. But these images are increasingly threatened by development, over-visitation and natural deterioration. How can these sites be cared for? This question is at the heart of my research on Catalina Island, where I will be conducting original documentation and condition assessment for a number of rock image sites. The first step has been, necessarily, to consult with the Tongva community – the original inhabitants of the island – to determine their vision for the future of these sacred sites. 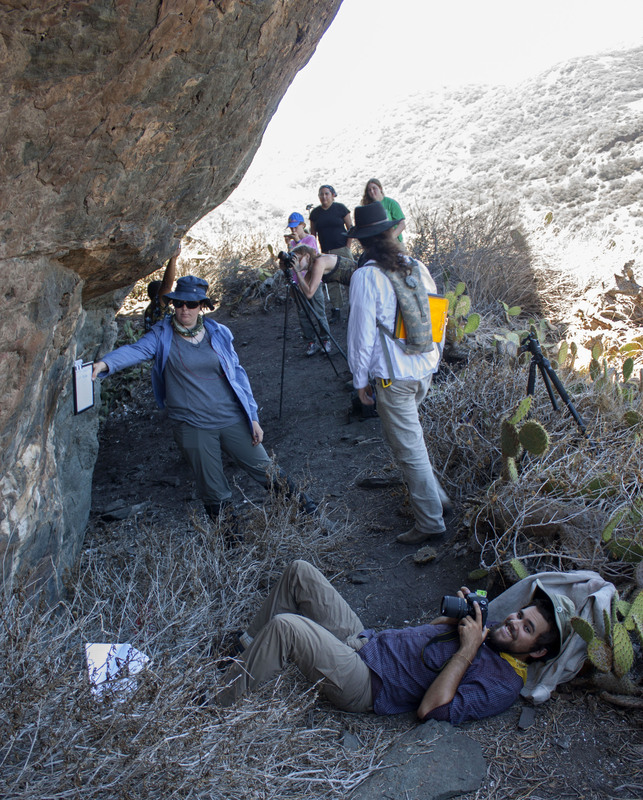 This was a component of this summer’s Pimu Catalina Island Archaeological Project (PCIAP) field school course, hosted at the WMSC, whose focus was teaching the fundamentals of indigenous archaeology. 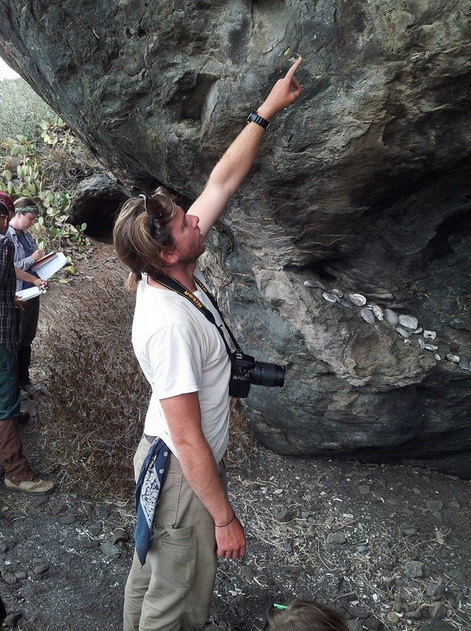 Through the course, I was able to both establish a connection with the Tongva community and to instruct students from diverse educational backgrounds in the fundamentals of “condition assessment” of rock image sites and documentation photography. Technology has played an important role in this summer’s research. We used Decorellation Stretch, a program that allows the user to manipulate digital photographs based on minute differences in Red/Green/Blue values for each pixel. 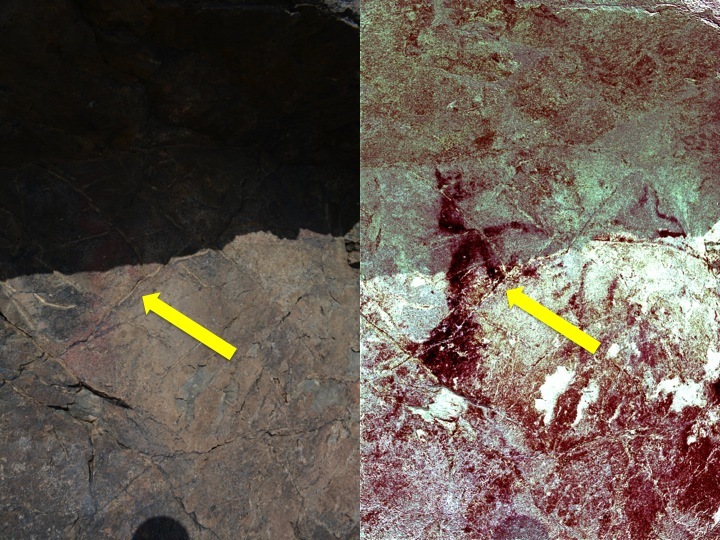 From these enhanced images, entirely new surfaces have been identified for further study, leading to a better understanding of the site’s original appearance to the Tongva. After a successful and productive season with PCIAP’s field school, a complete condition assessment has been performed for a number of rock image sites. This includes assessing not only the tangible elements of the image panels (such as the quality of the rock substrate and the condition of the images’ pigment), but also the intangible (such as the integrity of the landscape and the sites’ accessibility), which are of equal importance to the preservation of the sites’ significance. Gauging these qualities, along with performing photographic documentation, represent the first portion of my research. This summer’s work will be followed by continued consultation with the Tongva community, as well as the Catalina Island Conservancy (who own the land) and the island community, to explore what measures can be taken to best protect these sacred sites. Tom is a graduate student in the UCLA/Getty Master’s Program in the “Conservation of Archaeological and Ethnographic Materials”. He attended the Wrigley Marine Science Center this summer as part of the Pimu Catalina Island Archaeological Field School. This entry was posted in Graduate, Wrigley Institute on September 30, 2014 by Jessica Dutton. Last summer I was enjoying the cool ocean breeze while doing my graduate research on Catalina Island, but now the air conditioning in my car will have to suffice. This summer I’m a WIES Sonosky Fellow, and I drive 20 miles east of LA to a research facility in Irwindale, CA for my research. It’s quite a different environment here in the urban jungle compared to a more natural setting like Catalina, but lately I’ve been focusing on how biological processes might be able to help Los Angeles become more sustainable. At the Irwindale facility that is part of Dr. Ken Nealson’s lab, we are developing technologies that can potentially reclaim value from our city’s enormous amount of uneaten food. Some of our projects include preventing food waste spoilage, extracting valuable organic compounds, cultivating insect larvae from food waste, and producing organic fertilizers. We use microbes and insects to do most of the heavy lifting. Given the right conditions, specific types of microorganisms help convert the organics in food waste into compounds that help prevent further breakdown. This is actually a good thing, since we feed it to a hungry insect called the black soldier fly (BSF). The BSF larvae are able to live and grow quite happily off of this food waste. My specific project has been to track nutrients through this process and determine which products would make a good fertilizer. After some testing and modifications, I grow lettuce using the experimental fertilizer treatments to evaluate its performance. Together, these technologies are able to create value out of things that were once destined for the landfill. This is one part of the solution. Teaching people how to be more sustainable in their everyday lives is the other part. Aside from my research, this summer I’ve helped install two aquaponic systems at a local high school and a women’s shelter. 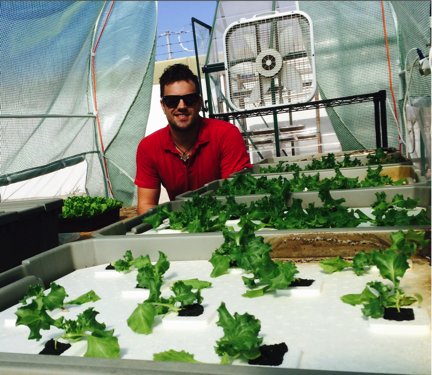 Aquaponics uses fish waste and microbial communities to grow fruits and vegetables. This method uses less water and is more space-efficient compared to conventional farming. The school I am working with is on track to open one of the first student-run farmers markets from food grown on the high school campus! 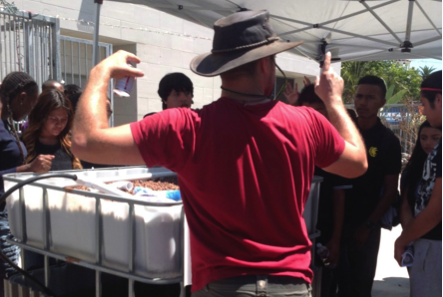 Providing these systems exposes kids, teachers, and the community to methods for growing healthy food in small spaces with less water. If we really want to change the way our city works, we have to educate all ages on why it’s important, and what they can do to help. We have a lot of brilliant and open minds here in LA, and I think we have what it takes to close the loop in our food system. I’m really happy to do my part to help get it started. This entry was posted in Graduate, Wrigley Institute on September 19, 2014 by Jessica Dutton.